Although metal, wood, horn and ivory were occasionally chosen for making a toothbrush handle, most often the thighbones of cattle were used. These bones were strong enough to withstand the bristle drawing process without splitting, when the brush later became wet during use. 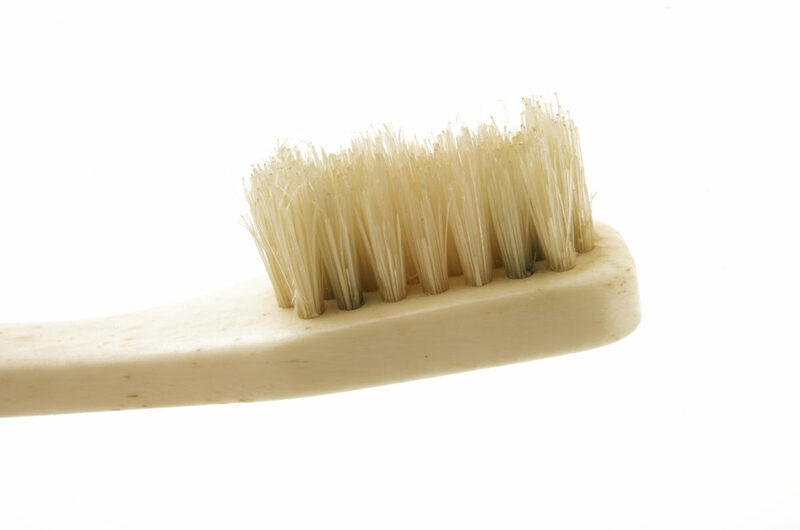 Some early toothbrushes were made with horsetail, goat or badger hair, but boar hair was used prevalently. 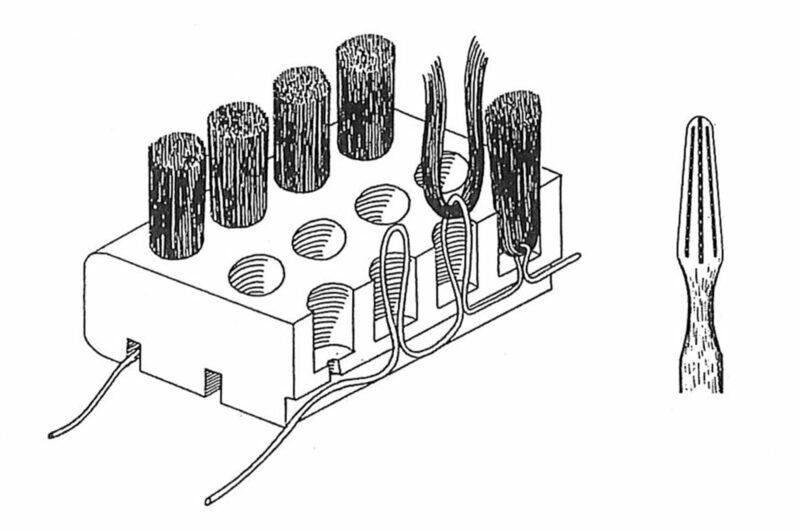 The boar hair, when frayed, provided adequate friction to clean tooth enamel. Tooth contours and crevices could be followed closely by the stiff yet flexible fibers, and even gum stimulation was obtainable with proper use. Mattick, BE 2010 A guide to bone toothbrushes of the 19th and early 20th centuries. Bloomington, IN: Xlibris Corp; Wynbrandt, J 1998 The Excruciating History of Dentistry. New York: St. Martin’s Press. 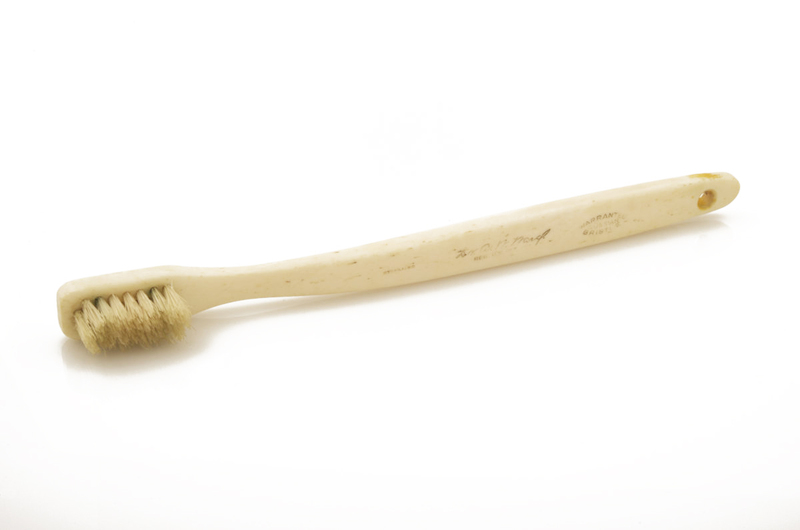 This circa 1930s polished bone, natural white bristle toothbrush (A148.8), with a short head and four tuft rows, may have been created with gum health in mind. 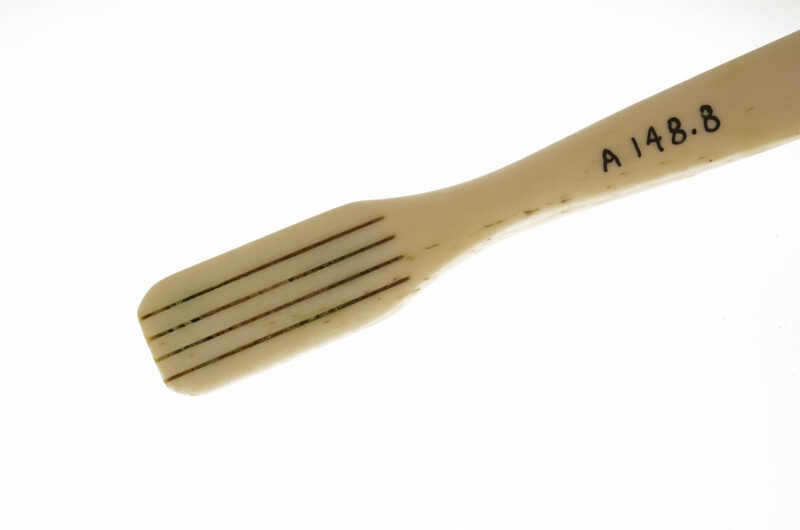 Designer and periodontist Dr. A. W. Ward’s name, "Warranteed Russian Bristle," and "Sterilized" are inscribed on the handle. View of the head. Green discoloration at the bristle bases indicates they were drawn with wire. View of the back. Grooves on the stock back indicate the four rows of tufts were drawn with wire.